(Tunis) – A long-awaited new law maintains restrictions over the construction and renovation of churches and discriminates against the Christian minority in Egypt. The law, passed by Egypt’s parliament on August 30, 2016, applies only to Christian houses of worship. Recent incidents of anti-Christian violence that left one person dead, several injured, and numerous properties destroyed were prompted or preceded by anger among some local Muslims over actual or alleged church construction. Even when authorities have made arrests, they have rarely prosecuted suspects, creating a climate of impunity for violent crimes that target Christians. The website of Al-Youm al-Sabaa newspaper published the law and explanatory memo on August 30. The new law allows governors to deny church-building permits with no stated way to appeal, requires that churches be built “commensurate with” the number of Christians in the area, and contains security provisions that risk subjecting decisions on whether to allow church construction to the whims of violent mobs. Estimates of the size of Egypt’s Christian population, the great majority of them Coptic Orthodox, range from 6 percent to 10 percent of the total population of 93 million. Authorities have done little in the years since the 2011 uprising to change policies that have long disadvantaged their community. President Abdel Fattah al-Sisi pledged to respect freedom of belief and made important visits to Coptic Christmas masses. Authorities, however, have failed to protect Coptic Christians from violent attacks and instead enforced “reconciliation” sessions with their Muslim neighbors that deprive them of their rights and allow attackers to evade justice. In some cases, Christians were obliged to leave their homes, villages or towns. Sectarian clashes have occurred with increasing frequency and intensity since the 2011 uprising. In the southern Minya governorate alone, the independent Egyptian Initiative for Personal Rights (EIPR) has documented 77 such incidents since January 25, 2011. Minya, where Christians are an estimated one-third of the population, has also been the scene of violent anti-Christian attacks in recent months. On July 17, a mob killed a young Christian man and wounded three others in Tahna al-Gabal after an argument that started between some Muslim and Coptic children escalated. Ishak Ibrahim, religious freedoms researcher with the EIPR, told the Daily News Egypt that the village had already been tense because of restorations to a church building. In late June and mid-July, mobs destroyed four Coptic homes in Kom al-Loufi and six buildings, including a nursery, in Abu Yacoub after Muslim neighbors claimed Christians planned to use the houses as churches. In May, a mob forced Suad Thabet, a 70-year-old Coptic woman, from her home in al-Karam and stripped her naked in the street in response to rumors that her son had an affair with a Muslim woman. Mobs have attacked Christians recently in other cities and towns as well. Video from a village on the western outskirts of Alexandria aired on YouTube in June showed scores of people in the streets chanting, “We don’t want a church.” The mob assaulted Christians and attacked a building next to a church that the attackers claimed offered religious services. 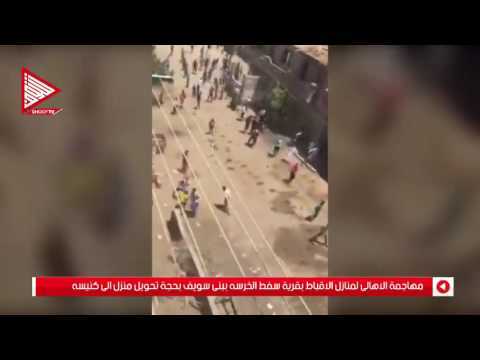 Another video that appeared in July showed a mob attacking Coptic buildings in al-Fashn, a village in Beni Suef governorate, north of Minya, after similar allegations that Christians were using a building for prayers. Though security forces arrested dozens of people following the sectarian attacks in Minya earlier this year, most were released without proper investigation or prosecution. For example, police released 16 people accused of the attacks in Abu Yacoub after a “reconciliation” session. Egypt’s parliament passed the new law three days after receiving a draft from the cabinet. The government had negotiated the law’s provisions with Coptic Church leaders in secrecy with almost no involvement from nongovernmental groups or activists. The church eventually supported the law, but other Coptic priests, activists, local human rights groups, and some Coptic members of parliament criticized restrictions that continue to discriminate against Christians. Such restrictions amount to discrimination on the grounds of religion, imposed on Christians without justification, Human Rights Watch said. Egypt’s constitution does not acknowledge freedom of religion beyond the three “official” religions – Islam, Christianity, and Judaism. Though the new law devolves power from the president to provincial governors, it requires the size of a church to be “commensurate with” the number of Christians in the area. Since the government has never released statistics about Egypt’s Christian minority, viewing the number as a national security issue, determining the size of local Christian communities is difficult and most likely arbitrary. The parliamentary memo accompanying the law states that governors should take into account “security and public safety” when deciding on church-building applications, effectively allowing mob violence to dictate whether church construction is authorized. Egyptian authorities strictly control most mosques, especially the appointment of their imams and the content of their sermons, and construction of mosques is regulated by an October 2001 Endowments Ministry decree. But unlike with churches, authorities rarely interfere with mosque building, and Human Rights Watch is not aware of any instance in which they have closed a mosque for failure to comply with restrictions such as on size and architectural features. The new church law allows existing unauthorized churches to legalize their status after submitting their papers to an administrative committee formed by the prime minister. According to the EIPR, many old churches – those in residences, for example – would not meet the law’s requirements, such as one that mandates that churches have a dome and specific internal features. The inability of many of Egypt’s hundreds of unlicensed Coptic churches to obtain licenses has been the cause of many sectarian incidents and the provisions in the new legislation may likely leave their status unresolved. A special forces police officer stands guard to secure the area around Saint Mark’s Coptic Orthodox Cathedral in Cairo, Egypt, January 6, 2015. Security is typically tightened at churches ahead of the holiday after a string of attacks on Christian targets over the past years. The law also includes a requirement put in place by former President Hosni Mubarak in 2005 to obtain a governor’s approval to renovate or expand a church. This provision runs counter to a 2013 Administrative Court ruling that said churches need only receive renovation permission from engineering authorities, according to the EIPR. The Egyptian parliament should amend the new law to apply to all places of worship in a manner that fully respects the right to freedom of religion, and should eliminate restrictions that are not in line with internationally accepted requirements to protect public safety, Human Rights Watch said. The parliament and authorities should also adopt legislation and policies that ensure protection of Egypt’s Christian minority from sectarian violence, such as serious investigations into such incidents, and hold accountable those who participate in or incite violence against Christians, as well as officials who fail to take all reasonable steps to provide protection and accountability. Under both the International Covenant on Civil and Political Rights and the International Covenant on Economic, Social, and Cultural Rights, to which Egypt is a state party, all Egyptian citizens have the right to observe and practice their faith, in private and in public, freely and free from discrimination. Laws that discriminate between individuals, or their houses of worship, on the basis of religion violate both Egypt’s constitution and international law. Article 27 of the ICCPR requires a country to ensure that members of religious minorities can freely practice and profess their religion.